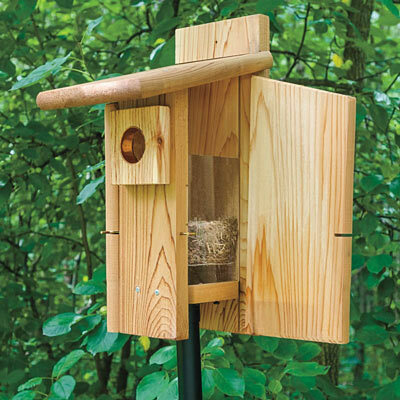 Safe, sturdy and well ventilated, our Ultimate Bluebird Nestbox has been specially designed with all the needs of Bluebirds and their little ones in mind. Crafted of durable, high-grade cedar with 2 hinged doors — one on the left for cleaning and one on the right for observation. Clear plastic is in place to keep baby birds from falling out, and the copper-lined entrance hole prevents larger birds and squirrels from intruding. When the fledglings are ready to leave the nest, grooves inside help them get their footing and soar Use the pre-drilled hole to hang on a tree or post (like our 2545 Heavy- Duty Pole). H14½"xW6½"xD9¼".